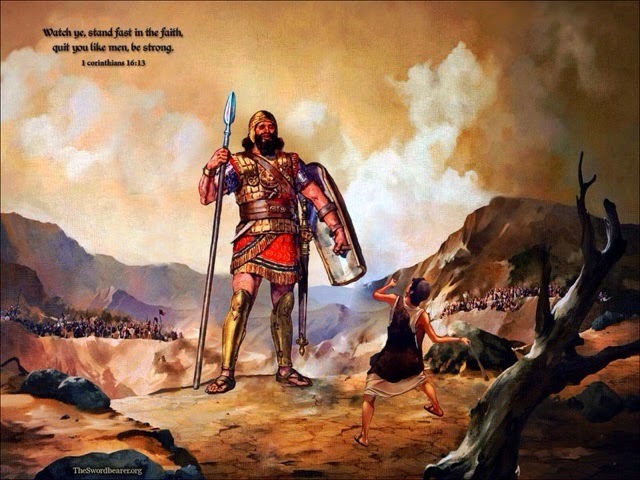 Mothers prayers,and thoughts of Love: Who Or What Is Your Goliath? The Philistines were a bunch of big loud bullies. They scared most that encountered them. They were pretty ruthless. The armies of Israel were no match for them. Intimidation was follie to them. Until God led David right into their path. No one saw what was about to happen coming. And surely the Philistines laughed at the thought of a young man; a shepherd standing against their biggest and baddest. When the giant laughed and faced this young boy with nothing but a sling in his hand and God on his side, he never saw the stone coming. Which was slung and sunk into the Giants skill. Dead he was. So who is your Goliath? Remember what God can do. Goliath can be conquered .